Be careful what you post. 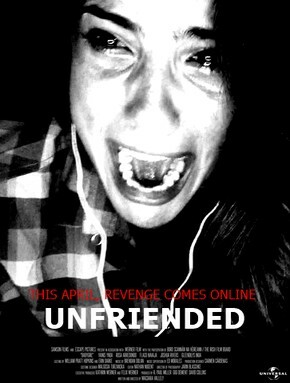 Universal Pictures’ Unfriended is a new breed of horror that will have you terrified from beginning to end. Despite watching, what amounts to FaceTime/Skype, iMessage windows, and Safari the entire time, this film will keep you on the edge of your seat as the horror unfolds and the mystery comes closer to being solved. The studio that essentially invented the American horror film is back to the forefront of the minds of movie-going audiences everywhere with this spine-tingling and groundbreaking method of visual and visceral storytelling for the screen. A new take on the tried and true ‘ghost vengeance’ horror plot, Unfriended will have you completely hooked from the time the entity shows up in the group video chat. Of course, you will likely be asking yourself throughout the movie ‘with friends like these, who needs enemies?’ Although this is a revolutionary new concept, I feel strongly it should remain a one-time thing. Unfriended is about a group of friends who encounter what they feel is a glitch in their group video chat. It isn’t long before the group deduces that the glitch is a molevolant individual hell-bent on seeking revenge for a shaming video that was posted to to the internet one year prior that was also the driving force behind a local high school girl’s suicide. With all the friends denying that they had anything to do with the video and gross taunting and shaming, the “ghost” engages them in a little game of “never have I ever…” that has deadly consequences. This is one of those horror films that is pretty well straight forward. So, I don’t really have a whole lot to critique. The direction, writing, and score were excellent and the pacing of the film was spot-on. It’s a very well crafted and produced horror film that will likely become a cult favorite of those who appreciate and thoroughly enjoy this genre. Although there isn’t any traditional cinematography in the film, the camera acts as the eyes of one of the characters as we stare at her computer screen the entire time, and effectively communicates the focus of a given point in the story. One of the technical elements that stands out to me is the editing. Now, on one hand, it does not look like an incredible amount of talent and time would go into a film such as this; but, that is the beauty of high quality editing. The fact that it does not feel “edited” is proof that the editor did an excellent job in cutting the thrilling narrative together. My biggest negative critique in the production is the fact the respective wifi signals weren’t disabled when the power goes out. Unless each of the characters was using a battery powered hotspot or had a cellular/data signal in their computers, when the power disconnected, the wireless internet signal should have died too. Although there isn’t really much in the way of character development, each of the characters can be read as possessing one of more of the infamous ‘seven deadly sins.’ This metaphoric perspective can be extended to the manner in which the various characters die during the movie. One of the characters possesses the “sins” of gluttony and sloth very clearly, another exhibits traits of wrath and greed, one of the friends is very prideful, showing acute signs of the sin of envy are seen in one of the main characters, and the sins of lust and bearing false witness (yes, I’m aware this isn’t one of the “deadly sins”) is demonstrably shown by the main protagonist. The aforementioned character traits are showcased throughout the narrative and are directly related to how each of the characters die. Yes, even the virgin dies in this film that breaks away from many horror tropes. Gather a group of friends and head to the movies to be thrilled during this horror film for the social media enthusiasts. Watch as high school drama goes way overboard and has deadly consequences. This is definitely a great date movie because I guarantee that you will be able to put on the “movie move” (as coined by Carmike Cinemas). If you don’t know what that is, you probably need to go on more dates. If you liked this review, please follow/subscribe to my blog. Thanks!